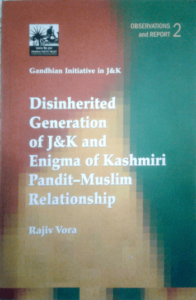 Kashmiri Muslim rapprochement grounded predominantly in politics and, similarly, in a mindset informed only by the media that tends to arrive at truth by ‘plebiscite of facts’; and, finally, the article begins rather than ends with a report of a unique experiment of bringing radical Muslim youths from the Valley to stay with displaced Pandit families in Jammu and dialogue with activist youth of Jammu – a glimpse into the hidden reality. Article is based on engaged observations and several dialogues in trust and confidence over past five years. Individual reports of some of these dialogues and visits have much more educative and informative material than in this two part article. Reports related directly are given in the appendix. 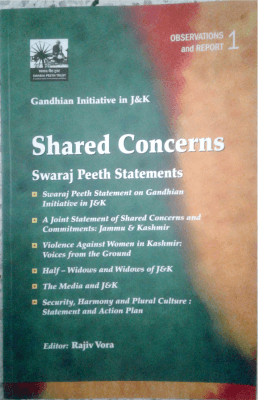 Appendix 7: Security, Harmony and Plural Culture: Statement and Action Plan. Appendix 8: Deliberation: Jammu Workshop. 13. 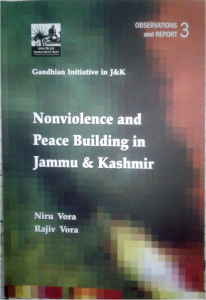 Community Based Nonviolent Peace Builders. 30. Gandhi Shanti Mitra Pledge ………………………………………………………………..